This is my favorite side dish for idly, dosa, upma and pongal. Here is the recipe. Grind coconut + Dalia peas + green chillies + ginger + salt, to fine paste adding required amount of water. This is chutney. For seasoning,take a small pan, pre heat oil, splutter mustard seeds, add urad dhall and asafoetida powder and fry it till golden brown. Pour it on top of chutney. Seasoning is optional. 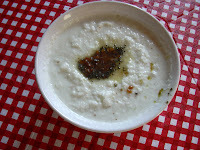 This is the traditional coconut chutney we make.